Are you searching for gifts to surprise your boss, friend or even a coworker who has lately scored a new job? Then custom bobbleheads is the best answer to consider to put your mind at ease. Custom bobbleheads are amazing and they can make your new desk or office interesting and a great. They also provide unique methods to celebrate or remember special occasions. Bobbleheads are fun, interesting and are original collectibles, making them the best gifts you can offer to a special person. You can order your customizable bobblehead today online and receive any face you require on the bobblehead body. 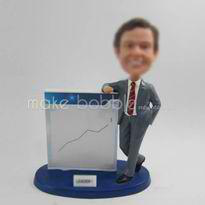 Mbobble offers amazing bobblehead designs related to business. Below I have added up some of the top business bobbleheads you can get. Do you have a colleague or a coworker in your company that you care about and want to buy a gift for them? 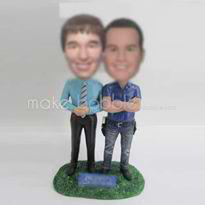 Then a best friend bobblehead with both of your faces is the best gift you can offer. This shows your trust level of friendship and how much you appreciate them for making you completely satisfied and effective or productive with your work. This also creates a healthy and a favourable working environment. Do you have a co-worker (your boss even) who loves to wear black suits? Black suits are perfect for business. They give you stunning looks and tend to surpass the crowd. 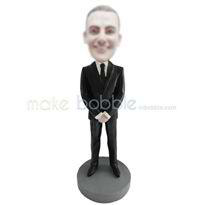 So if you are looking to surprise a black suit wearer, you can design a black suit bobblehead with their face on them. This makes them to love their sense of fashion or style and feel dignified. 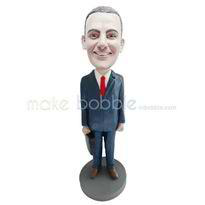 If you have a colleague who loves to wear blue suits, you might consider buying them a blue suit bobblehead with their face on them. Blue suits can be customized by just including little fashion details since they are straightforward, simple and perfect for business. By giving them this gift they feel fit for the job and they feel recognized for the great efforts they put in their work. Do you have a business partner who has helped you to add values and bring sufficient capital to your business or improved your business skills and support your business and much more? Nevertheless, a good partner deserves to be rewarded and appreciated. 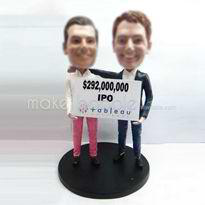 Giving them a partnership bobblehead with both your faces can make them feel appreciated for the services they provide leading to future benefits of your company. What kind of gift could you award your friend or coworker for becoming successful in their business career? What can be greater than having your face painted in a bobblehead? This makes them feel appreciated and it motivates them to become more and more successful. Mbobble offers great designs of success bobbleheads you desire. If you have a sales person who has helped you increase your sales income, ensure customer satisfaction and contribute to economic growth of your company, they truly deserve to be appreciated. But what kind of gift can you offer a sales person? Mbobble has great designs you can choose from. You can have their face put in a bobblehead while holding a sales chart. This will truly put a smile on their face every morning when they sit at their office or desk. If you are wondering on how to surprise or what gifts you can give your special person for their anniversary, birthday, promotions, graduation and much more, you can consider using bobbleheads. Bobbleheads are great gifts and its unique and original ways make them great presents for you to offer to your loved ones. They are fun, symbolic and interesting. Have a look at Mbobble and view their many bobblehead designs related to business.